No single space project in this period will be more impressive to mankind, or more important for the long-range exploration of space; and none will be so difficult or expensive to accomplish. We propose to accelerate the development of the appropriate lunar space craft. 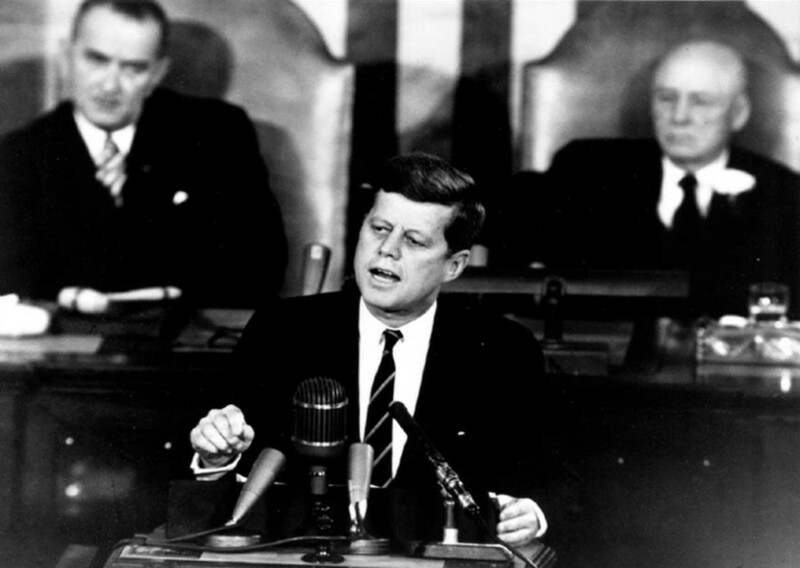 In 1961 President Kennedy announced to the world that the United States should attempt to put men on the moon before the end of that decade and many people thought he and the idea was crazy science fiction. That is until America led the world into the future when Neil Armstrong stepped on the lunar surface on July 20th, 1969 and became the first human in history to step foot on the moon. The idea was bold, brazen and, yes, a little bit crazy but crazy in an inspirational, look towards the sky and America’s future way. And it was America at its greatest in my view. It was America leading the way for the rest of the world to follow and the time has come for all of us to look towards the sky, our atmosphere, and into our oceans, and to come together to lead the way for the rest of the world to follow these great United States of America. I believe we possess all the resources and talents necessary. But the facts of the matter are that we have never made the national decisions or marshaled the national resources required for such leadership. We have never specified long-range goals on an urgent time schedule, or managed our resources and our time so as to insure their fulfillment. Today’s announcement by 50 or so Congress men and women led by Freshman New York Representative Alexandria Ocasio-Cortez and Massachusetts Senator Ed Markey for a Green New Deal offers our country the same hope and inspiration as President Kennedy announcing our plan to land on the moon. Except the idea of the Green New Deal is likely even more important. The Green New Deal calls for a “10 year national mobilization” led by the goal that within that time America is “meeting 100% of the power demand in the United States through clean, renewable, and zero-emission energy sources”. And while these are aggressive goals we need just that, to think boldly and creatively if we are ever to solve our climate crisis before it’s too late. Should we care from whom this comes from or whether AOC (Congresswoman Ocasio-Cortez) as she’s often called is new to Congress or is “so” young at age 29? We should not care about the politics, whether this is a Republican or Democratic Bill, or whether one sees themselves as a Democratic Socialists or Capitalistic Conservative or something else. And while I am certain that the reactions by many to the proposed new law will be highly political (and critical) in nature we all need to understand that the pollution and problem does not care about our politics. Should we care that the goals are aggressive and would require change on a scale rarely seen in our society’s history? Or for that matter that other countries are doing or not doing one thing or another to address this global crisis? Rather than spend precious time debating climate change, a debate the science has made clear is over, or what countries like China, India or others are doing to address the issue or whether they are doing it fast enough, the time has come to embrace the science and have the United States do what it has done for so very long. Lead the world into the future. And in this case that leadership needs to rapidly be towards a clean future rather than continuing to protect fossil fuel oil companies, utilities, auto manufacturers and others who want to live in an antiquated past filled with greenhouse gases that is rapidly destroying our atmosphere and oceans. There is a fantastic article and podcast on NPR’s website today about the proposed law as well as a copy of the proposed Bill itself. You can find it here and I suggest that everyone read it but, perhaps more importantly, I ask that everyone dream of what’s possible, of what’s needed and of how American’s can come together to eliminate man-made carbon pollution from our lives and environment before it’s too late. We can do this, it is our generation’s moonshot, it is our generation’s greatest challenge, but just as America inspired the world to look to the sky in the 1960’s we can do it again by leading the world in the right direction towards curing our sick and dying climate. Now that would be a good deal for everyone on earth, a New Green Deal.